Sometimes I am reminded why I live in Sydney. Sometimes I get to go to the new Audrey Kawasaki exhibition in Surry Hills, meet the artist (who is like, my total favourite if you don’t know yo) and see her new body of work… which is equal parts of amazing and astounding. Picked up a Mark Ryden book too at Outre, which although was a drunk impulse buy, was a total win. If you don’t know Mark’s work. Get on it, HERE. 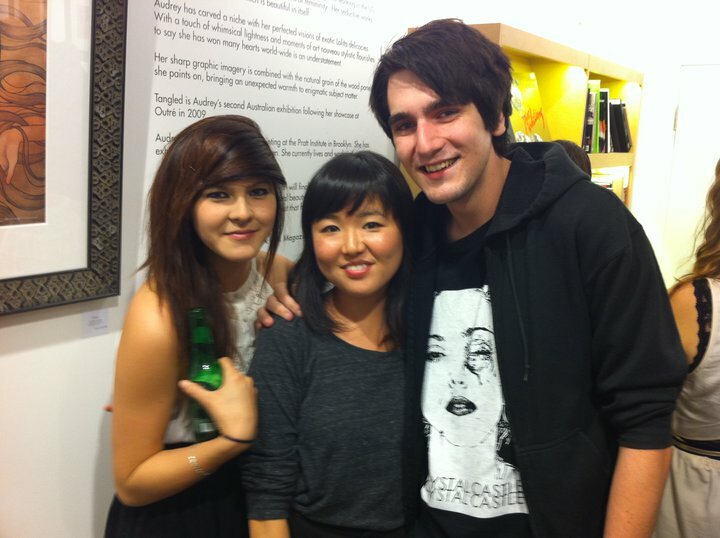 Phylicia, Audrey Kawasaki and myself at Outre Gallery, Surry Hills. In other fabulous news. ‘Together ALONE ALONE Together’ completely sold out the season! The shows were brilliant and the cast and creatives were given some really great feedback from audience members who came out in the pouring rain to see some new, high calibre pants-down-good theatre. To all those people, I say, you win. Although my Shopfront placement is now over, the relationship I forged with the company is the beginning of something very special me thinks. I had a blast, made friends and danced to Justin Bieber, which is neither here nor there (but a little bit fun). Excited yet? I am. I’d book if I wasn’t in it. No seriously. Do it. This entry was posted in General Raving, Projects I Help With, Theatre, Visual Art and tagged aada, ArtsLab10, Attempts On Her Life AADA, Outre Gallery, Shopfront Contemporary Arts, Sydney actor, Sydney portraiture artist, tom christophersen. Bookmark the permalink.